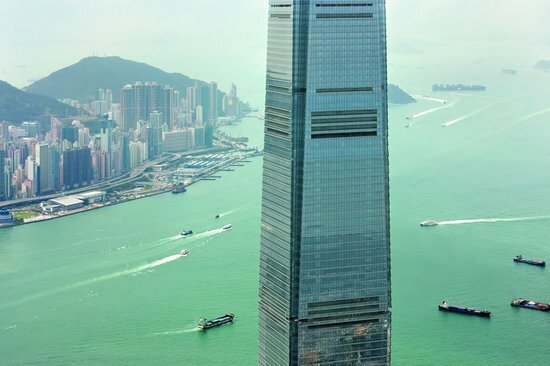 There is a brand new tower gracing the skyline of Hong Kong and sitting majestically on the top 17 floors of this 490 m-tower (1,588ft) is the brand new The Ritz-Carlton, Hong Kong. 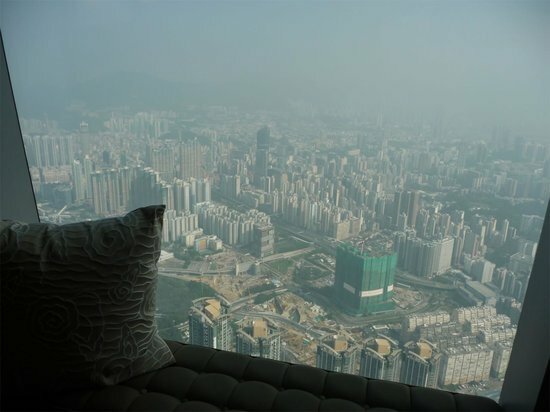 Sitting in the International Commerce Centre (ICC), the world’s highest hotel marks a comeback for the hotel company, which closed operations in its former location in Central in 2008. Being an ardent Star Wars fan the first thing that came to my mind on visiting the Ritz-Carlton Hong Kong was Cloud City. Instead of the Millennium Falcon, I was zipped up to the Hotel’s lobby on the 103rd floor from the hotels lobby on the ninth floor of the ICC Center in an ear popping 52 seconds. The Porte-cochère features the magnificent Hong Kong skyline as backdrop while a cool ocean of Palissandro blue marble stretches across the entire space and throughout the hotel. Anyone wanting to stay here will definitely need a head for heights. But what they get in return is pretty much a walk in the clouds, with breathtaking wall-to-ceiling views of the city. 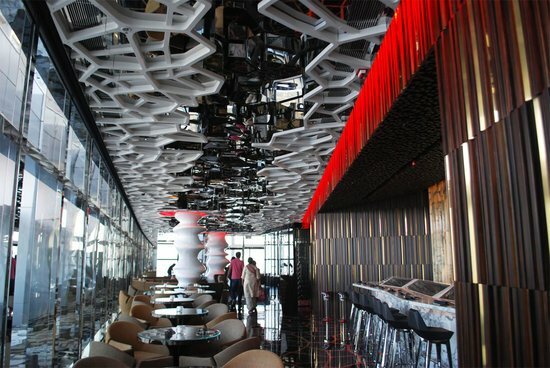 As guests of the Club Level rooms, we were ushered into the Club Lounge located on the 116th floor, where we were checked in. 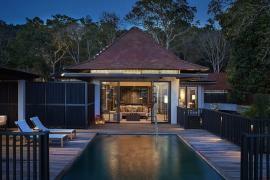 Chic, modern, homey best describe the ambience of the lounge. Its use of soft lighting, modern classic furniture, and shelves that resemble suit cases make it ideal spot for relaxation or a quick meal. 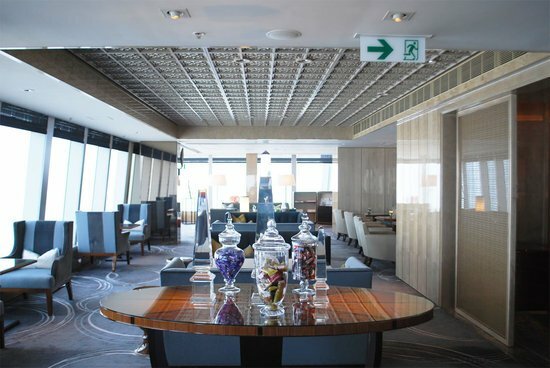 The 24-hour Club Lounge offers guests a healthy breakfast, mid-day light snacks, afternoon tea, evening hors d’oeuvres, chocolate treats and cordials, as well as late night snacks. They also cater to specific meal requirements and as complete vegetarians; we were extremely pleased with our specially served noodles and vegetable soup. The Lounge also has a meeting room ideal for a small meetings or presentation. For those looking to relax, there is also a generous collection of books suiting all genres; from Forbes to Harry Potter. We were then escorted to our Club Room on the 115th floor. After being familiarized with the room and its amenities, we sat back to gaze out onto the stunning views of Victoria Harbor. Our room-with-a-view had all the makings of a lush Ritz-Carlton room. Plush carpets, state-of-the-art rooms accessories including 42 inch LCD TV, iPod docking station with an iPod preloaded with about 2,000 songs, Blu-Ray player, complimentary in-room Wi-Fi Internet access and Nespresso coffee making machines. 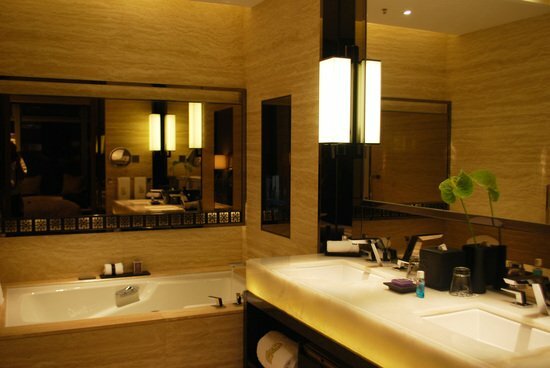 A highlight is the marble bathroom with shower areas and bathtub with an embedded LCD TV and toiletries from Asprey London. The rooms have all ceiling-to-floor windows with window ledges that allow for some cozy corners – provided there is no worry of vertigo or anxiety attacks of being too high off the ground. 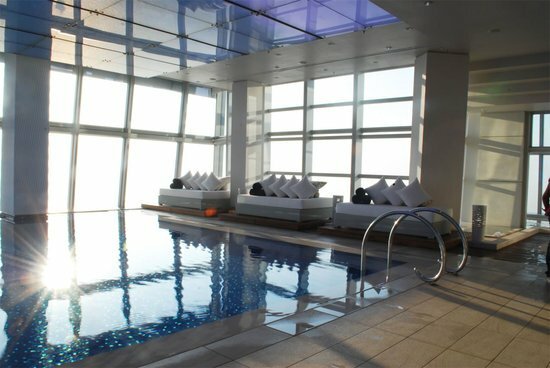 At the very top on the 118th floor, sits the world’s highest recreational facilities including the 24-hour fitness centre with an outdoor terrace. 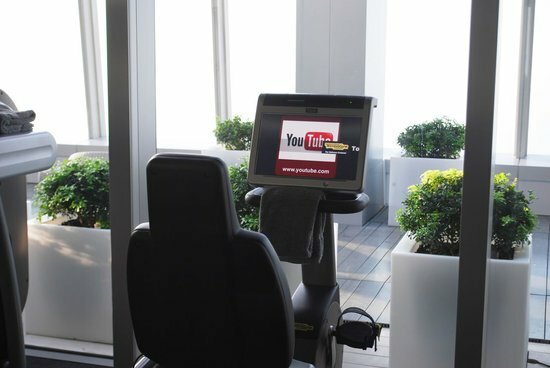 The gym comes power-packed with Techno gym equipment including Kinesis One and the latest cardiovascular equipment all connected with Visioweb, a digital platform offering internet, TV and iPod connection during workouts. 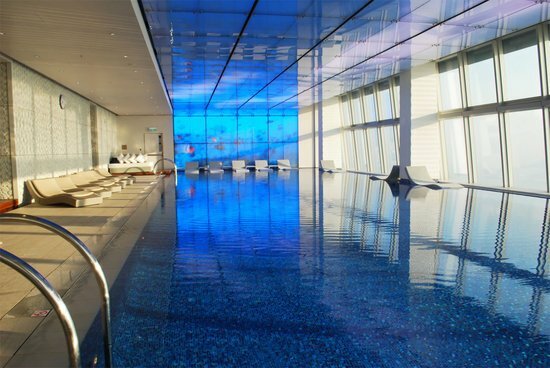 An indoor infinity swimming pool too sits on the top floor of the hotel and features 144 LED screens on the ceiling displaying images of the ocean for a relaxing ambience, if you still need one. There is also an outdoor Jacuzzi. 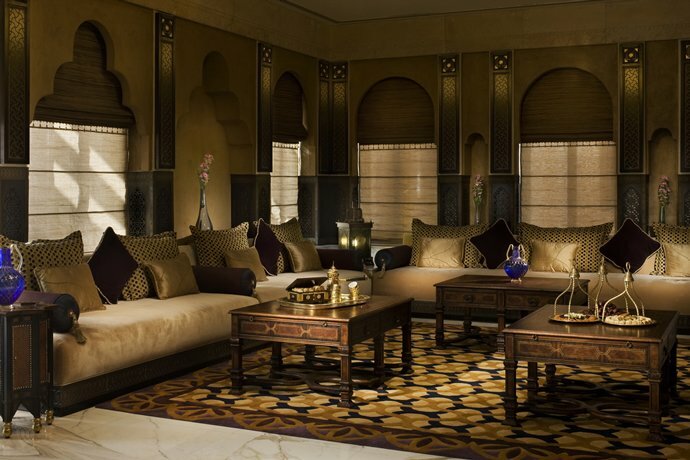 For more pampering, The Ritz-Carlton Spa by ESPA is located on the 116th floor, once again taking home the accolade of the highest hotel spa in the world. 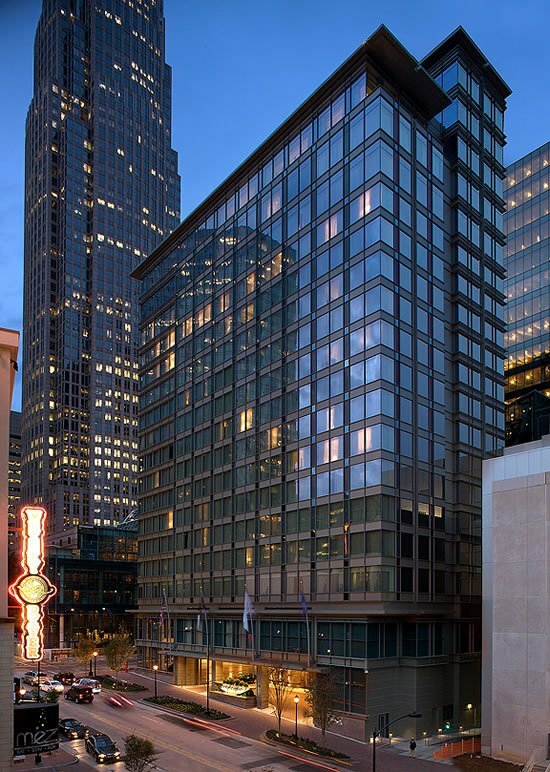 The Spa features 11 treatment rooms including two couples’ suites with sweeping views across the city. 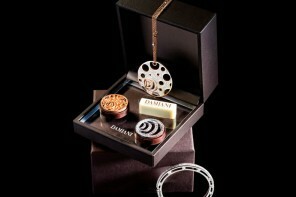 The 90-minute Lava Shell Body Treatment comes highly recommended and is available for HKD 1,485 ($190). 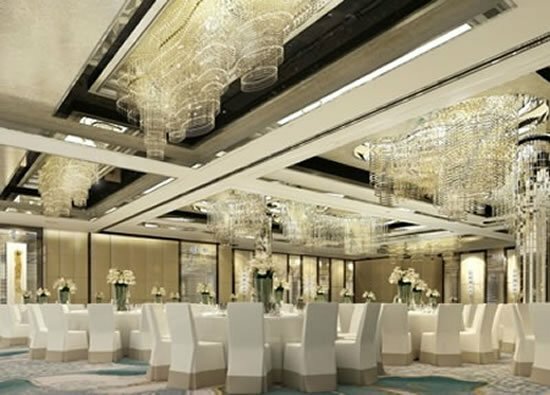 The Ritz-Carlton is pretty much set on becoming Hong Kong’s next hottest dining destination. 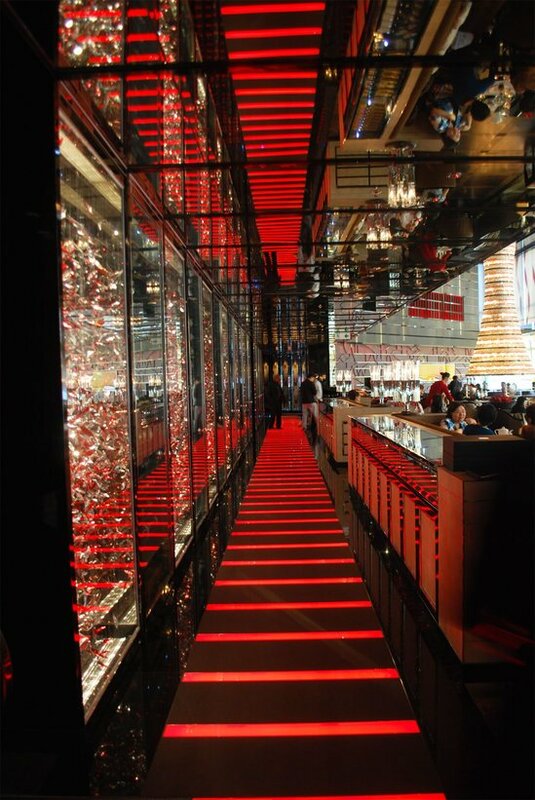 Three of its six distinctive dining venues are on the 102nd floor, each with a LED-lit pathway takes you inside. 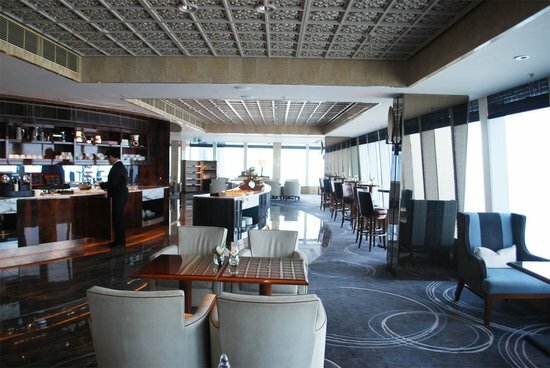 The Lounge & Bar (pictured above) serving the hotel’s daily breakfast buffet and the traditional high tea; Tosca, the hotel’s signature Italian restaurant features an open kitchen with a wood-burning oven, Tin Lung Heen or ‘Dragon in the Sky,’ is the hotel’s Cantonese restaurant and Ozone, the world’s tallest bar is located on the 118th floor. 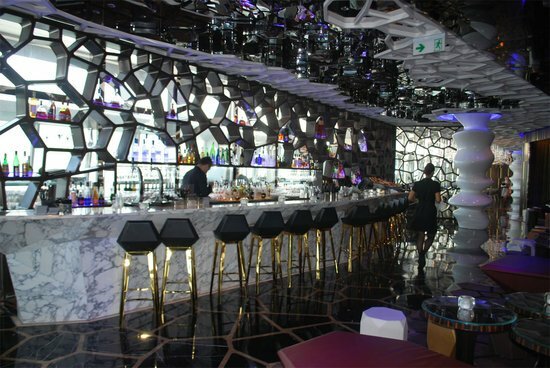 Glamorous and modern, Ozone is a patchwork of gilded wood, leather and marble serving cocktails, Japanese cuisine, and Asian tapas. 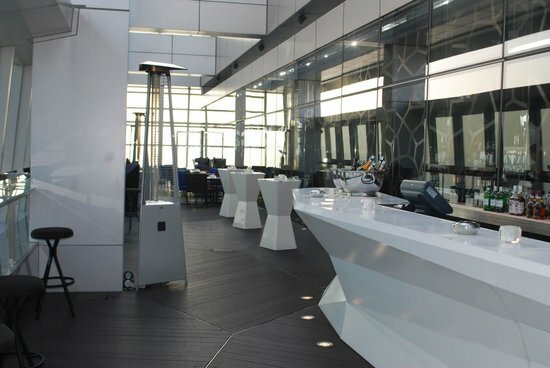 The Ozone allows for some private dining rooms including the popular O2 which attracts a minimum billing of HKD 20,000. 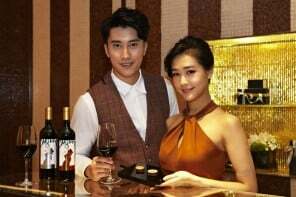 For those looking to indulge, their most expensive wine the 1982 Petrus (3 liters) is billed at HK$1,000,000 ($128,299) while the 40-year old Glenfiddich is available at HK$100,000 ($12,829) per bottle and HK$7,000 ($898) per glass. 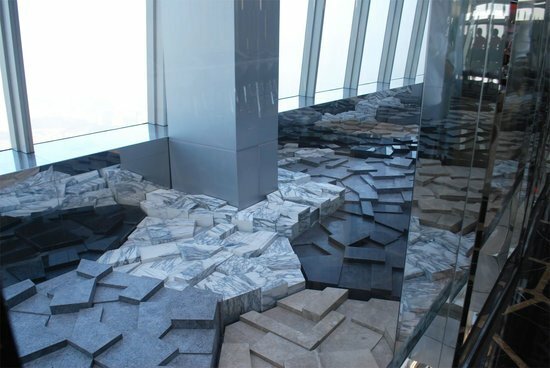 A unique outlet is the Café 103 (popularly known as the Chocolate room)- the first ever of its kind in Hong Kong is located on the 103rd floor lobby level. Café 103 is opened for afternoon tea, lunch and dinner buffets and its intimate feel make it a great spot for afternoon tea along with some delectable little treats. A delicious little detail at Café 103 is its chocolate-themed tea set, where chairs, napkins, dishes, glasses, menu cards and even the uniforms of the female waiting staff are in chocolate brown. The menu does not disappoint either. From cocoa nib chocolate bread, marble cheese cakes; chocolate orange confit macaroons to White chocolate berries shots, chocolate mille-feuille milk chocolate apricot and chocolate framboise tart – Café 103 is every chocoholic’s delight. 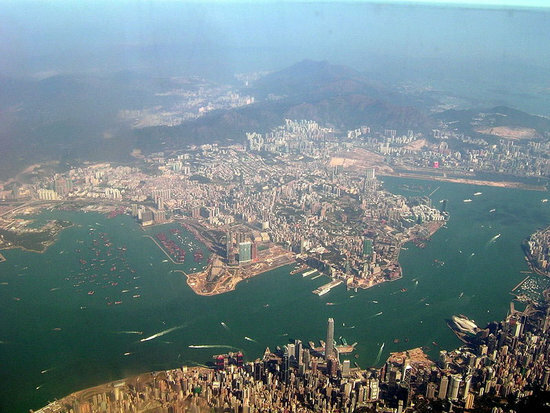 Standing tall in the Victoria Harbor, The Ritz-Carlton, Hong Kong couldn’t have asked for a better address. 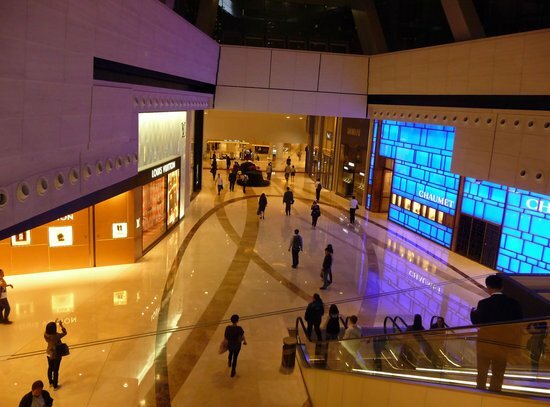 A luxury shopping mall ‘Elements’ (pictured above) and Subway connections are directly underneath connecting Kowloon station to the Airport express and the rest of the city. And, in 2015, a new high-speed rail terminal being built nearby will begin delivering tourists daily from Shanghai and Beijing, while the old international airport will reopen as a cruise terminal. Rates at the hotel will start at HK$6,000 ($769) a night for a Deluxe room (50 sq m) going up to HK$100,000 ($12,829) for The Ritz-Carlton suite (365 sq m). 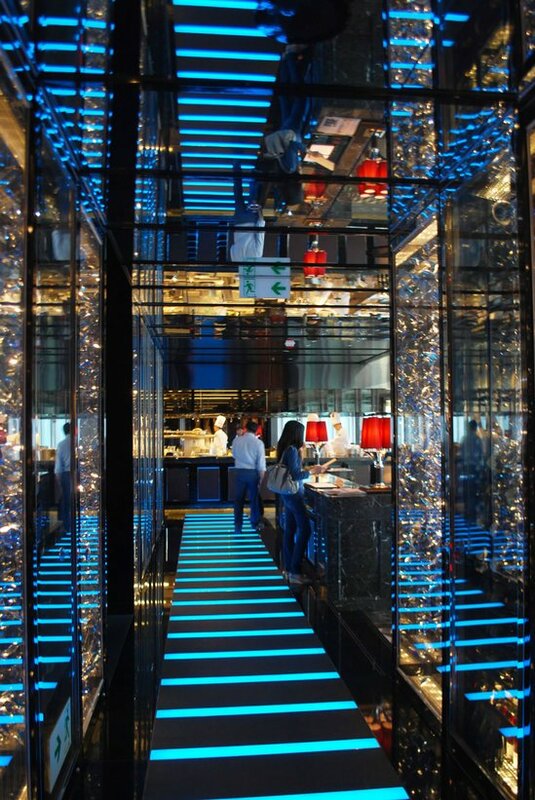 The Club Deluxe room costs HK$7,000 ($898) while a Club Junior Suite is available for HK$9,000 ($1,154). 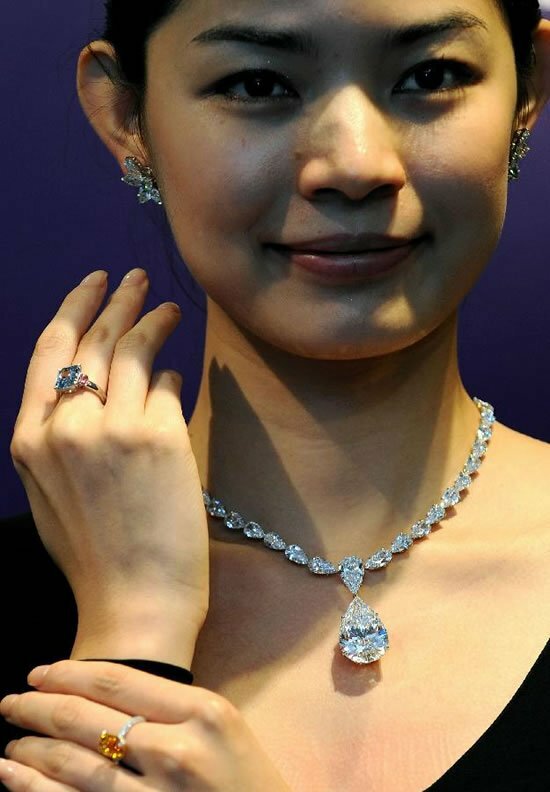 After all the good things in life come with a steep price-tag. Having said that, one thing that stays with you throughout are stunning views of the city that the hotel offers and this one, is Free for all. Access for guests with disabilities – The Ritz-Carlton, Hong Kong has eight wheel-chair friendly rooms. 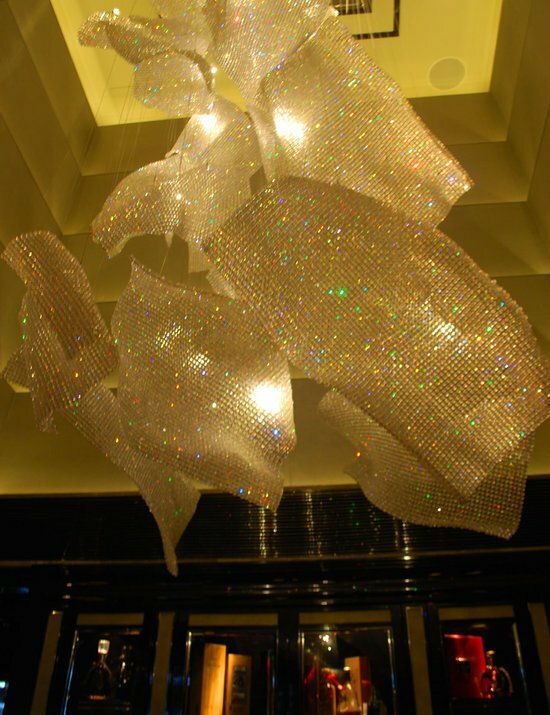 Swarovski chandelier at Tin Lung Heen. Pathway to Tosca the Italian restaurant. 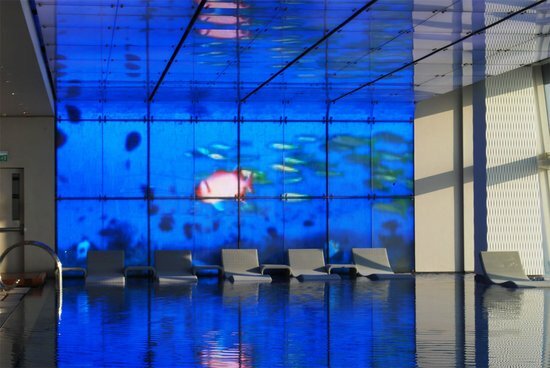 144 LED panels with soothing images. The outdoor area of Ozone can get chilly in the nights. Designer Masamichi Katayama has drawn inspiration from the Eden Garden for Ozone.